The Law of Definite Proportions (or Proust's Law) states that in a single chemical compound (such as H2O or CO) the ratio of it's component elements is a fixed whole number ratio. For example, in water (H2O) the ratio of hydrogen to oxygen is 2:1 (sometimes written 2/1). In Carbon monoxide (CO) the ratio of carbon to oxygen is 1:1 (or 1/1). Always remember that the law of definite proportions concerns the ratio of elements in a single compound. Here is the example of water visualized. This also applies if you use multiples of your original ratio. For example, you could double water's 2:1 hydrogen to carbon ratio. This result's in a 4:2 ratio with two water molecules produced as the end result. This is visualized below. The Law of multiple proportions applies when two or more elements/compounds have multiple ways of combining into different compounds. This is different from the law of definite proportions where we looked at the ratio of elements in a single product, here we are looking at multiple products, as the name of the law implies. When you have a fixed amount of one element (such as carbon (C) or Nitrogen (N)) and you combine it with differing amounts of another element (such as oxygen (O)) the differing amounts of differing amounts of variable element can be expressed as a ratio of whole numbers. For example, the combination of carbon + oxygen forms two simple compounds which illustrate this point. The first is carbon monoxide (CO) and the second is carbon dioxide (CO2). If you start with a fixed 100 grams of carbon and combine it with 133 grams of oxygen, CO will be formed. If on the other hand you combine it with 266 grams of oxygen, CO2 is formed. The ratio of the different amounts of oxygen (266/133) simplifies to a whole number ratio of 2/1. This is the effect which the law of multiple proportions highlights. 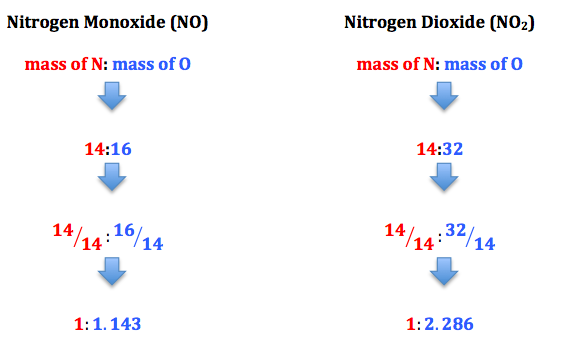 Another example using nitrogen monoxide and dioxide is illustrated in the example below. As we can see the ratio of the different oxygen levels (2.286/1.143) is a simple whole number ratio of 2:1 as the law of multiple proportions would have told us. Thank you for reading! Hopefully you understand the difference between the law of definite proportions and the law of multiple proportions! This helped so much. I had watched many videos, but this helped the most.